Captain Phasma’s hunt for Lieutenant Sol Rivas leads her to the planet Luprora in her desperate gambit to cover that she lowered the shields to Starkiller base. On the ground, her and her pilot pursue Rivas into a native village. They don disguises to blend in, but the ocean world of Luprora has some surprises for the First Order. I rather liked some of the turns the story took in this issue. The similarities of the planet to Phasma’s homeworld, her having to don a disguise but still managing to find a helmet, and the reveal that her pilot was a female was all pretty cool. With the gender neutrality of First Order armor, and not being able to hear the inflection in their voices, it can be hard to remember that not all of them are men, even when you know the main character herself is a female concealed in such armor. Aside from that, the fight with the big water monster was another plus. Not only did the cover get it right, but it was something new and not a rehash of a film monster. The story doesn’t dive any deeper into Phasma’s character, but it does continue the chase and being to develop the world of Luprora. One of the nice things about this issue is that the artwork takes an upswing. There’s some nice panels in this issue showing off the new world, the creatures, and even Phasma’s new armor. All of the detail, coloring and line work is relatively the same, but the composition of the panels is better. 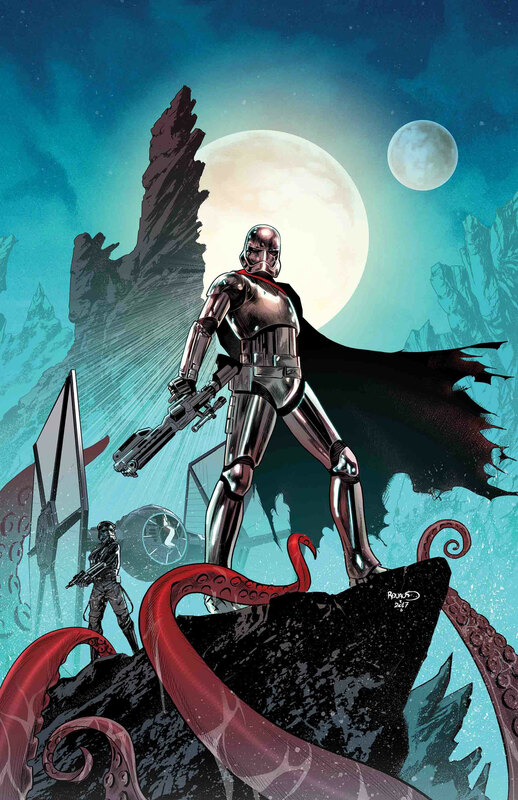 With some interest growing in the story, and some more intriguing artwork, I give Captain Phasma #2 a four out of five metal bikinis.